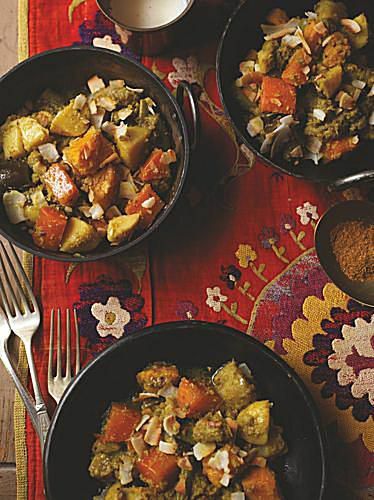 This tasty mixed vegetable casserole originates from Gujurat in W. India. It is mainly cooked in winter, but the ingredients may vary depending on what is available locally. I've sampled a couple of versions of the dish during my trip to India: one was wet with a thick greenish gravy, the other was a dry casserole of colourful vegetables. This recipe is similar to the latter version, which I much preferred. Use any combination of vegetables you like, but do include several root vegetables to give the dish a hearty, starchy base. Recipe reprinted with permission from Great Escape by Gordon Ramsay. First make the Masala paste. Put all the paste ingredients into a food processor. Add 3 tbsp. of water and blitz to form a thick paste. Cut the potatoes, aubergines, sweet potato or yam, carrot and banana into bite-sized pieces, and the beans into 1 inch/2 cm pieces. Keep each ingredient separate. Add the mustard seeds, carom seeds, and asafoetida, if using. When the seeds begin to pop, add the masala paste. Cook for 2 - 3 minutes stirring frequently. Put the potatoes and carrots into the pan and cook for 5 minutes before adding the rest of the vegetables, salt and remaining spices. Fry over a high heat for 5 minutes, then reduce the heat, add the water and stir. Cover and simmer for about 10 - 15 minutes or until the vegetables are cooked through and tender. Transfer to a warm serving bowl and garnish with a sprinkling of coconut shavings if you wish.